The Flutter Vehicle Control Kit is an easy way to control a standard R/C Car, Drone, or other project. 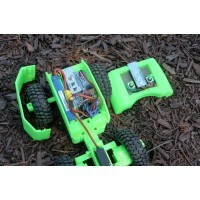 The kit is a drop-in replacement for any R/C car radio, but can be programmed to do much more. Unlike standard R/C car radios that limit you to 3 or 4 channels, Flutter has an unlimited number of control channels. Under normal operation Flutter transmits 32 bytes of data 50 times a second, which is enough for over 100 control channels. Save 5% over buying the components separately! 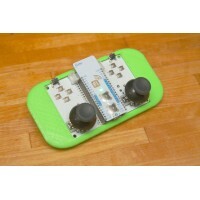 This kit includes Flutter Basic radio boards. If you want to use the Pro, please buy the "Vehicle Control Kit - Pro". Want to build your own Scout robot but can't find a 3D printer to use? Buy parts from us!One complet..